This post was written by guest author Sean Haubert. Find out more about Sean below. Hi, my name is Sean, and I’m an early adopter. I spend way too much money on new gadgets, and pester all my friends to join me on new websites. I sign up for every social site I can find. I try every iPhone app my credit card will allow – much to my wife’s chagrin! Seriously, it’s a problem, and I’m getting help. In the meantime, I’ve been trying to throw myself into the world of geo-social location services, Foursquare, Yelp, and now Facebook Places. The problem is, I’m just not getting it. I’m forcing myself to use it, to see if I can start to justify using it at work. For instance, the other day we took our niece and nephew out for ice cream on Long Island. Perfect chance to take Foursquare for a test drive. I checked in. And I found a deal. $1.00 off at Starbucks. On Friday afternoon. I was 2 days late. Is this thing on? Is there anyone out there? Who exactly are all the people using these services, and where are they hiding out? I think I need to hire Foursquare’s publicist. They are really doing a lot with their 3 million member audience, certainly they’re garnering a lot more press than they deserve. Or are they? Now Facebook has joined the fray, as they just launched Places. On the day of the launch, Foursquare announced their busiest check-in day ever. In the week since Places has gone live, I have had one FB friend check-in. It was from his couch. He wanted to unseat his wife as mayor of their living room. Dennis Crowley, the co-founder of Foursquare, was recently quoted as saying Facebook Places is not that great or interesting. It’s a pretty boring service, with barely any incentives for users to keep coming back and telling their friends where they are. To me, the most interesting thing about Places is that it has a potential audience of over 500 million people around the world but that can only be a good thing for location-based services, like Foursquare, as Facebook will educate the masses about check-ins. Plus, take a careful look at their logo. Notice anything unusual? Yes, that red icon is eerily similar to Google’s own Places. And what is the icon placed on? Look at the map carefully, and you will certainly see a number 4 – a direct shot at Foursquare! Foursquare is probably more concerned than Dennis lets on. As for now, Facebook’s geo-social service is very bare bones. With a ready-made audience of 500 million, it’s hard to believe that Facebook won’t start fleshing out their service, perhaps start offering partnerships with brands and events. Basically, look for Facebook to follow Foursquare’s build out plan. But Facebook certainly was a little creepy in their rollout. By default, everyone’s Facebook privacy settings were stacked in Places’ favor. Whether you knew it or not, you had the ability to check-in. And your friends had the ability to check-in. And THEY had the ability to check YOU in. Kevin Rose and Doug Albrecht demonstrated this on Diggnation when they logged on and checked in their vegan producer at a nearby steakhouse. In fact, Facebook got a lot of slack about it, and posted their own video on how to control the manner in which you and your friends’ information is shared on Places. 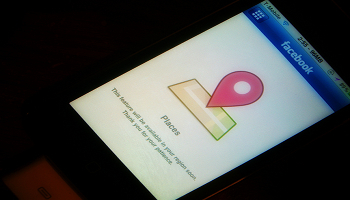 Can Places win the geo-social war? Only if Facebook changes the default settings to Private and disable the status tagging feature without user opt-in. Facebook needs to give back privacy control to the user. I get it. Maybe we could do it in a less creepy, big-brother kind of way? After a 10+ year career in advertising, Sean Haubert realized the decades old advertising model was no longer relevant. So, he started a Social Media Marketing consultancy to help his clients start a whole new type of conversation between all the stakeholders. Sean is now the Social Media Manager for the New York Road Runners, the world premier running organization. He recently received his MS in Integrated Marketing Communications from Manhattanville College, where he wrote his thesis on how to introduce analytics into SM marketing campaigns. Sean also has no problem writing about himself in the third person. Learn more about Sean on Facebook and Twitter.